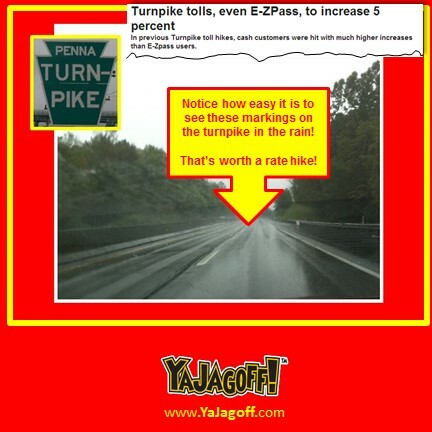 So, the Pennsylvania Turnpike announced another rate hike starting 2015. (click here for article). This is a wonderful idea! My gosh… it’s such a great road and there’s such great service… ok.. never mind! They learned it by watching #Ohio. Bastards raise tolls, and half the turnpike is 50 MPH. That’s it! Instead of RAISING prices, shouldn’t we be all getting a “Please pardon our mess while we’re under construction” discount??? On a side note, wouldn’t it be great if, when YOU wanted money, you could just announce to the public that you were raising your fees. Man tells employer he is raising his own hourly rate by 5% and that he will be taking naps 2 times per day. And now that it is going to cost me almost $40 to cross the state, how about installing a pawnshop at the rest stops where I can sell one of my bikes, pets or kids so that I can pay the toll in cash on the other end of one of the most miserable roads in the Commonwealth, YA JAGOFFS! Thanks to the Trib’s @BreakingNewzman for the tip and for being our Honorary Jagoff Catcher! Big Announcement! The 3rd Annual #ThingsThatTurnPeopleIntoJagoffs March Madness Tournament Starts Tomorrow!